CERSAIE 2017 was no exception, with designers once again flocking to Bologna, Italy, to show off fresh takes on classic ideas. Hundreds of exhibits from dozens of countries demonstrated not only the versatility of tile, but also designers' ability to combine traditional techniques and new technology to create functional art. CERSAIE sets the stage for the following year's most notable looks. For example, CERSAIE designers took large formats to new heights in 2016, while also launching an embrace of natural stone that has continued into 2017. The most popular tile designs of 2018 will surely incorporate a handful of prominent trends seen at CERSAIE 2017. These stunning concepts can be featured in a variety of capacities, including modern kitchen backsplashes and outdoor tile. Keep an eye out for these exciting trends. Vibrant and intricate, encaustic tile has been a top choice for centuries, with the first period of significant popularity arriving during the 13th century. Following a brief return during the Gothic Revival era, the style has once again hit its stride. Although today's encaustic tiles retain much of the visual appeal that made them a hit during the medieval and Gothic Revival eras, they also appeal to today's market, which calls for a more personalized approach. This year, encaustic's prominence may largely be a response to the growing popularity of the patchwork look. 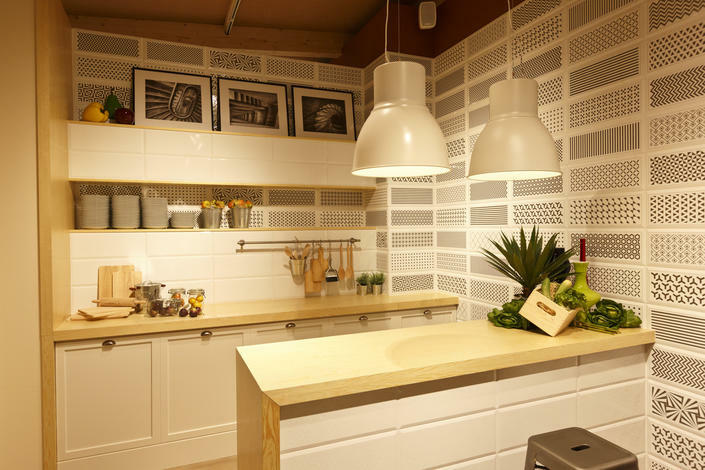 With encaustic tiles, this trend takes on an appealingly vintage vibe. Designers have found other ways to represent the patchwork aesthetic, however, and this year's patches include metallics and hand-drawn elements. Increasingly versatile, encaustic tile will cover new ground in 2018. Designers will integrate the concept into several spaces, using cement and traditional ceramic tile to deliver ornate designs. 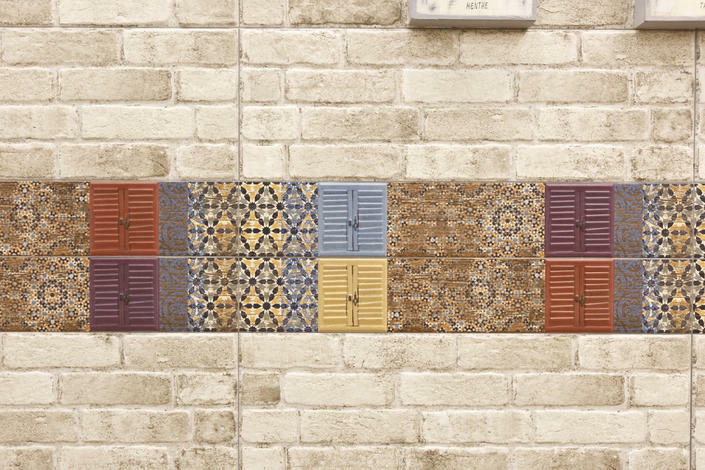 From modern bath tile to decorative kitchen tiles, encaustic will take over every room in the house and move into the outdoor with concepts like patio tile. Designers will increasingly apply the concept to porcelain. Consumers may find this advantageous, as porcelain is notoriously durable and affordable. Memorable patterns and textiles continue to dominate the tile industry. Their popularity in recent years stems from designers' desire to bring a dynamic, textured feel to tile, thereby adding instant visual interest to any room inhabited by patterned or textile-inspired tiles. Some patterns evoke traditional design concepts, while others can only be referred to as contemporary. One of the strongest and most notable trends at CERSAIE 2017, chevron patterns defied expectations and inspired countless attendees. If this year's event is any indication, the unique pattern is about to take over. Sometimes confused with herringbone (in part because so many refer to the style as French herringbone), chevron involves inverted V's, which create a continuous zigzag shape. Like herringbone, however, chevron adds great dimension and modern visual appeal to any room. Regularly seen in wood flooring, chevron is more and more prominent in the world of tile. Modern takes on chevron increasingly involve black-and-white patterns — perfect for contemporary kitchen tile. New takes on chevron lend the pattern even greater versatility. For example, the pattern's V shapes can be offset by vertical lines or combined with other graphical patterns. 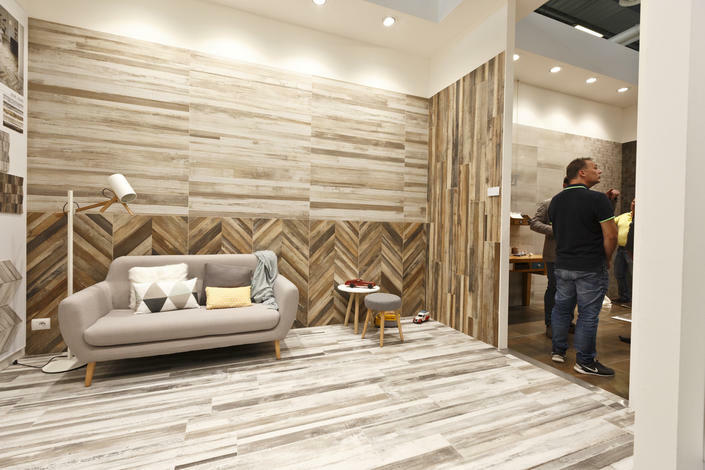 CERSAIE 2017 offered a quick glimpse of chevron's versatility and the new heights the trend could reach in 2018. Mermaid patterns grant flooring a tropical feel and are, therefore, quite popular among those who adore Moroccan design. Subtle or bold, depending on the context, this unique pattern can easily be incorporated into bathrooms, kitchens or entryways. The pattern is typically thought of as vibrant and colorful; surprisingly, this year's most notable mermaid examples were uniquely muted. This forced viewers to focus on unique tile shapes and textures rather than bright colors. This approach ties in nicely with the neutral trend of the past few years, which, based on the exhibits at CERSAIE, is not about to abate. In addition to proving a hit at CERSAIE 2017, mermaid patterns are currently taking over social media. Pinterest reports a surge of interest in the mermaid and fish scale look, which is beloved for its mystical aesthetic. The pattern is popular not only for tiles, but also decals, wall art, light fixtures and even pillows. Already popular in 2017, ceramic tiles will remain a top choice in 2018, especially as enthusiasts seek a handmade look. Designers appreciate the numerous personalized opportunities that ceramic tiles present; they can bring the most outlandish concepts to life. Manufacturing innovations make ceramic a realistic option for all price points, while also expanding artistic potential. Designers will incorporate many of the elements outlined above into ceramic tiles; get ready for ceramic chevron, encaustic and mermaid tiles en masse in 2018. From mermaid patterns to fabric-inspired looks, tile designers continue to break barriers with their refreshing takes on familiar concepts. Advanced technology, combined with the revival of nearly forgotten artistic concepts, promises to take tile design in a new and exciting direction. 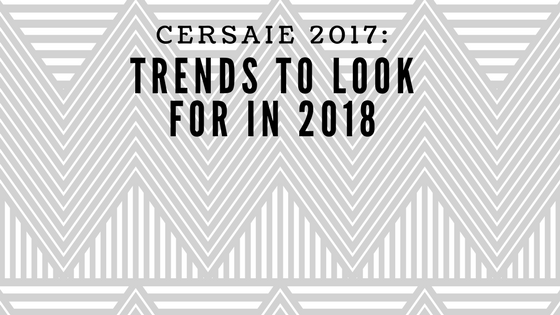 If the trends of CERSAIE 2017 are any indication, 2018 will be a remarkable year in the tile industry. Are you looking for more tile designs? Come explore our inspiration gallery and contact us today with any questions.